In 2010 Crisafulli Associates was hired as general contractor for the addition and renovation to the Green’s Appliances and Furniture store at 1207 Central Avenue in Albany. The project involved renovation of the existing 10,000 sq/ft facility as well as an 8,000 sq/ft addition all built under LEED guidelines. 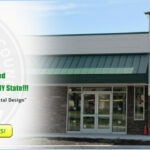 The project resulted in a drastic transformation to the facility and we helped Green’s become the first LEED certified appliance and furniture store in New York State. We are proud to say that we helped Green’s go green.